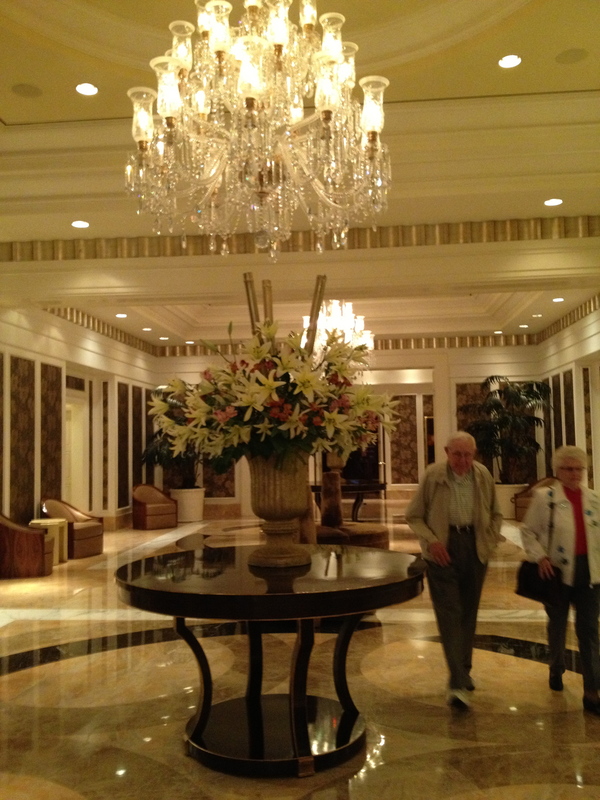 Seven swanky lobbies to see : Vegas hotels (Part One)! | Oh, the Places We See . . .
← Something new (at least to me) at LAS! 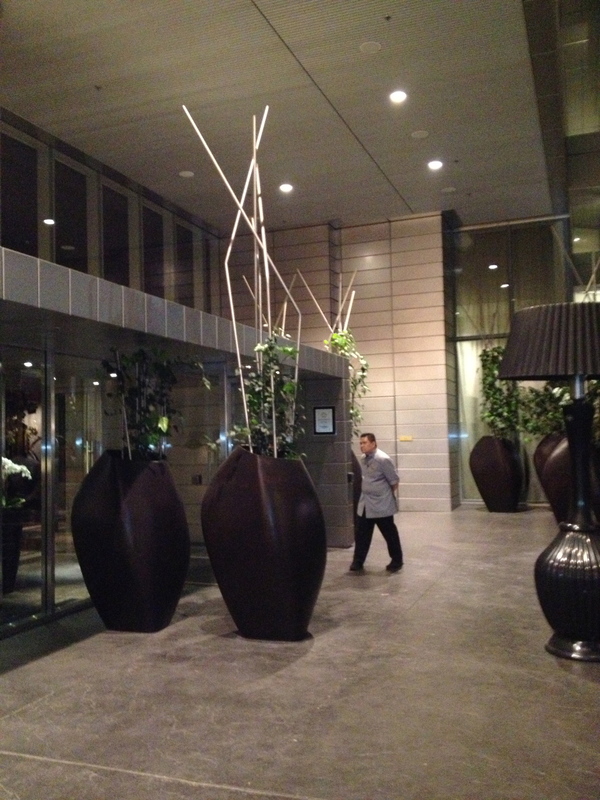 Seven swanky lobbies to see : Vegas hotels (Part One)! No matter where you stay in Vegas, you can’t escape (nor would you want to) the lights, sounds, and excitement of The Strip. It’s where people from all over the world gather, roam, raise a toast, and stand in awe of a glittering environment built on sand. Las Vegas — like no other city in the US! Work has taken me to Clark County, Nevada, on several occasions this past year, and my husband has been able to join me on this adventure. During the “after hours” and on the weekends, we take our time exploring Vegas’s hotel lobbies — eating at restaurants, watching people go by, and taking pictures of whatever we find fascinating. And we’ve found a lot. We like watching people who are watching other people, too! One thing seems pretty certain: we love the hotels — architecture, themes, decor, accoutrements, and lobbies! So, here we are sharing our seven favorite hotels — and letting you in on something fabulous to do in Vegas: lobbying! 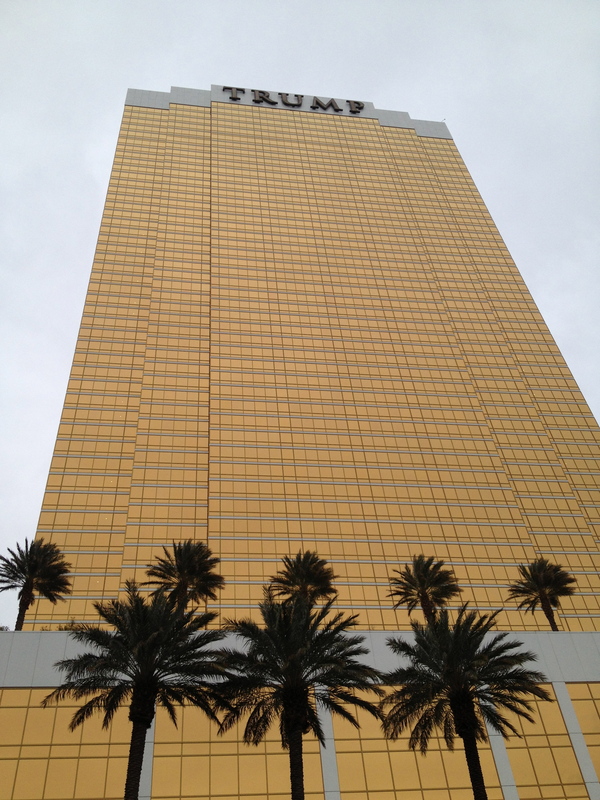 A towering gold structure across from Fashion Show Mall, Trump stands tall against the skyline beckoning visitors and guests to “Own Vegas”! Tasteful arrangements of white flowers reach toward crystal chandeliers, inviting guests to peruse the tasteful (and rather understated) glamorous lobby. When we asked an employee in the gift shop where we could get the best view from the hotel, she directed us to the 23rd floor. Go to the Sales Office, she instructed, and ask if you can look out at the city. We took the elevator, but the office door was locked even though the posted hours didn’t indicate an early closing. (If you go there, let us know what you see!) And if we go back, we’ll take a second stab at it! 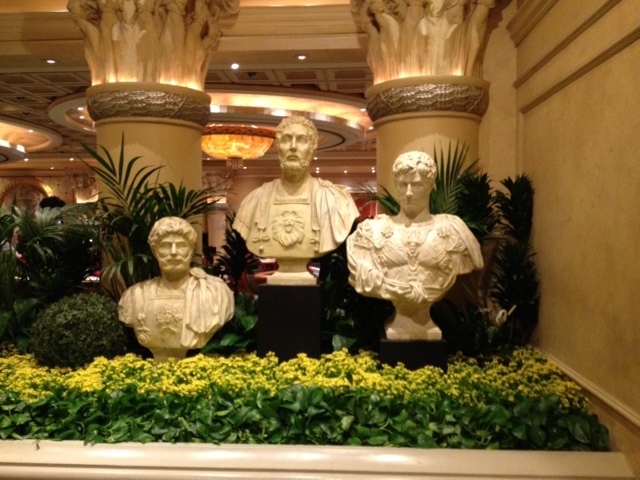 Head to Caesar’s and expect to be immersed in the immensity of the property and the classic statuary! Located right on The Strip, Caesar’s is known for its nod to Classicism and all that’s orderly and artsy in its own right. 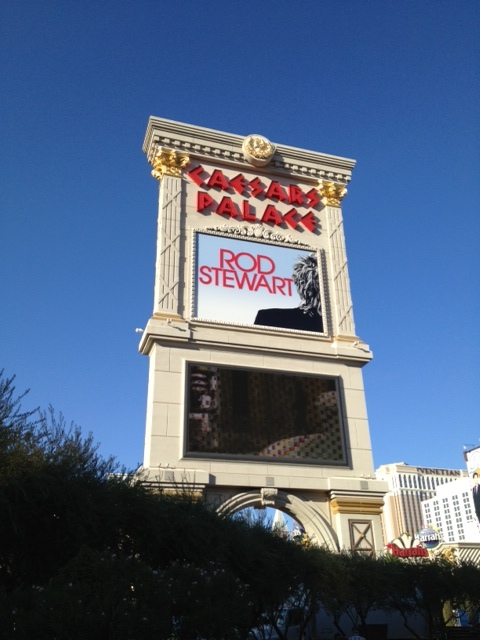 Although our trips haven’t coincided with that of our favorite performers, we hope to catch a Caesar’s headliner act at some point. Even if we don’t get back, we have fond memories of the outdoor dining areas, the palatial casino, and the shops where the well-dressed can be seen slipping into the latest fashions. 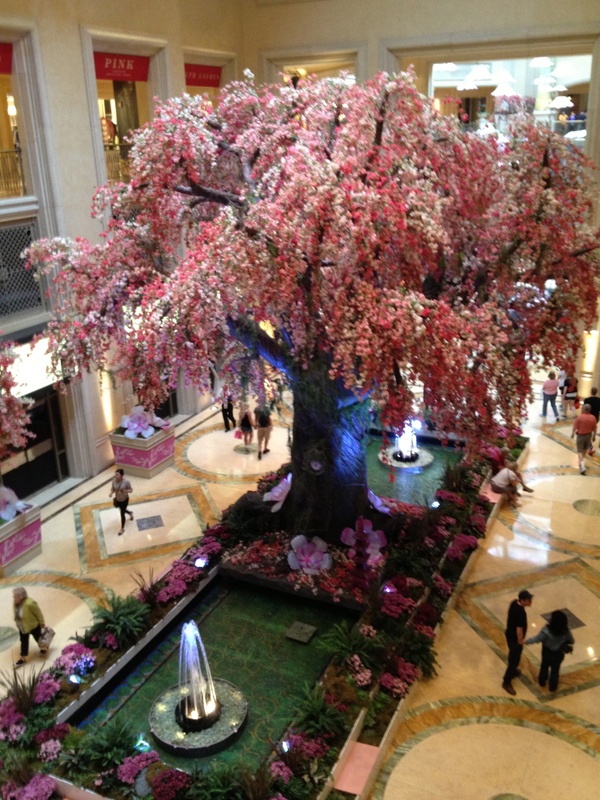 Enormous lobbies in The Palazzo are decorated seasonally, like this one featuring a towering pink tree in the center of what I call the Waterfall Lobby. 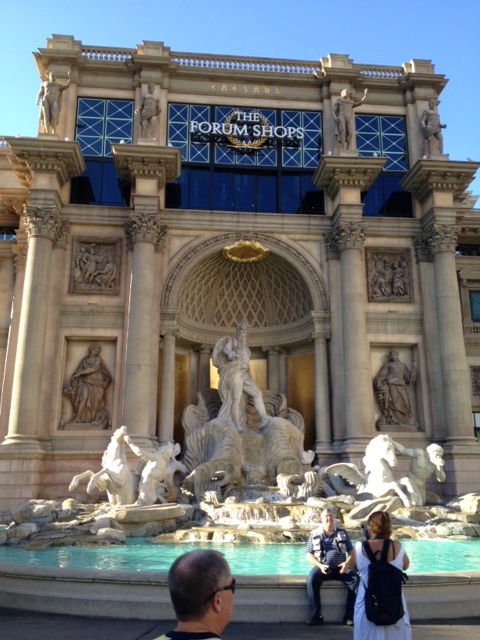 And for some reason, Palazzo lobbies seem quiet. Perhaps it’s the enormity of the place, or just the calmness that comes when visitors snap pictures — almost reverently — of these larger-than-life visions of nature in various forms. 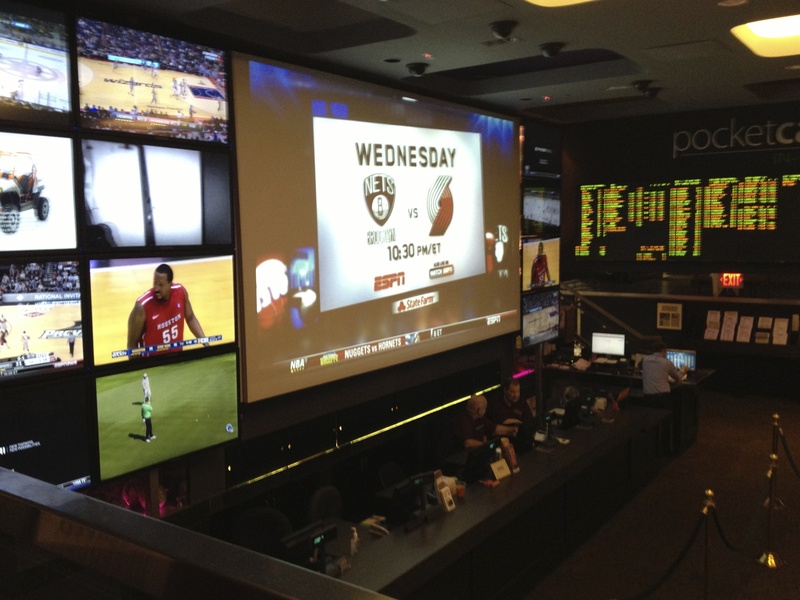 But we had another goal in mind after reading a Las Vegas Sun article on Vegas sports books — places where betting on March Madness rivals most anything else happening in town. 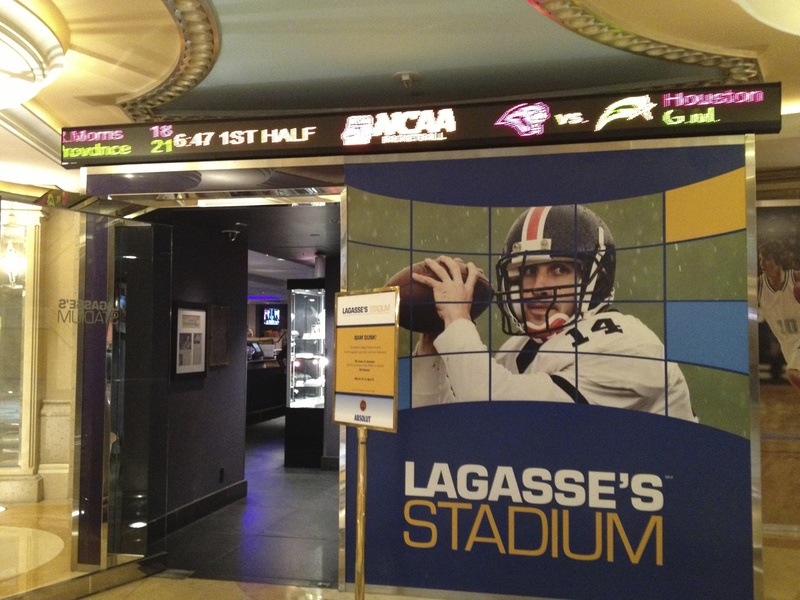 Named one of the biggest and best, Lagasse’s, is located on the lower level of The Palazzo. Combining Emeril Lagasse’s signature award-winning cuisine and a luxury betting venue with more than 100 HD TVs and stadium-style seating, Lagasse’s is worth seeing even if you don’t know anything about a parlay or a point spread. 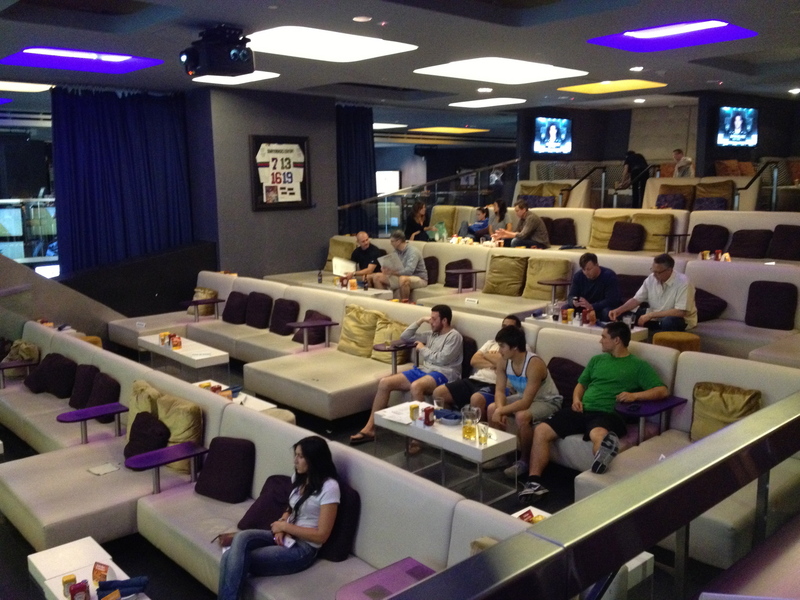 Massive screens at Lagasse’s feature golf, basketball, horse racing. You name it, they’ve got it! These stadium-style seats were mostly empty the morning we visited, but it’s a different story during March Madness! Through the almost-hidden entrance, this tucked-away quiet hotel with beautiful appointments and five-star rating offers a breathtaking view of The Strip from two public locations. Head to the Tea Lounge with its Oriental-inspired lighting and colorful carpet for a floor-to-ceiling view of Planet Hollywood and Paris Las Vegas. 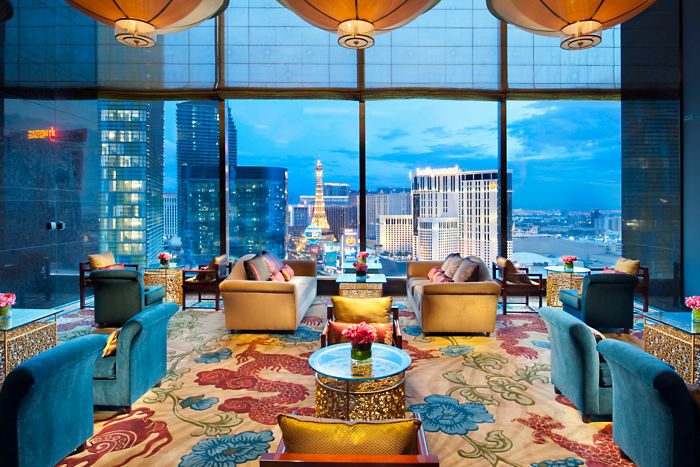 Or move into Mandarin Bar for a more dramatic view of the south end and a panorama of The Strip from two vantage points. We were fortunate to meet and chat with a couple from U. K. celebrating their 14th anniversary — and they, too, said the view was one of the highlights of their trip to Vegas. 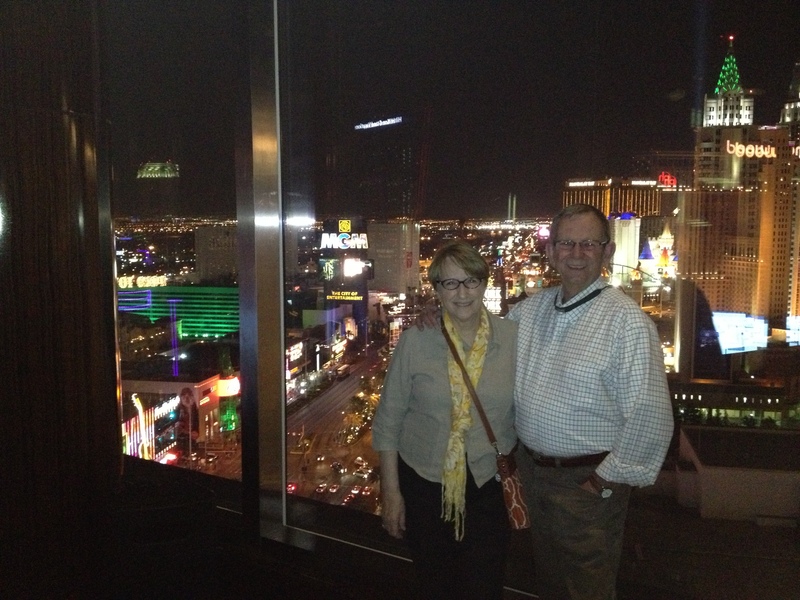 Here’s the picture they snapped of us with the MGM Grand on the left (green) and Monte Carlo on the right. And that’s it for Part One! We’ve saved our last three favorites for the next post. Check back soon. Please leave us a message if you’ve been to Vegas and have a lobby, hotel, restaurant, or venue you love. We’re always looking for great Places To See! This entry was posted in Nevada, Travel. Bookmark the permalink. 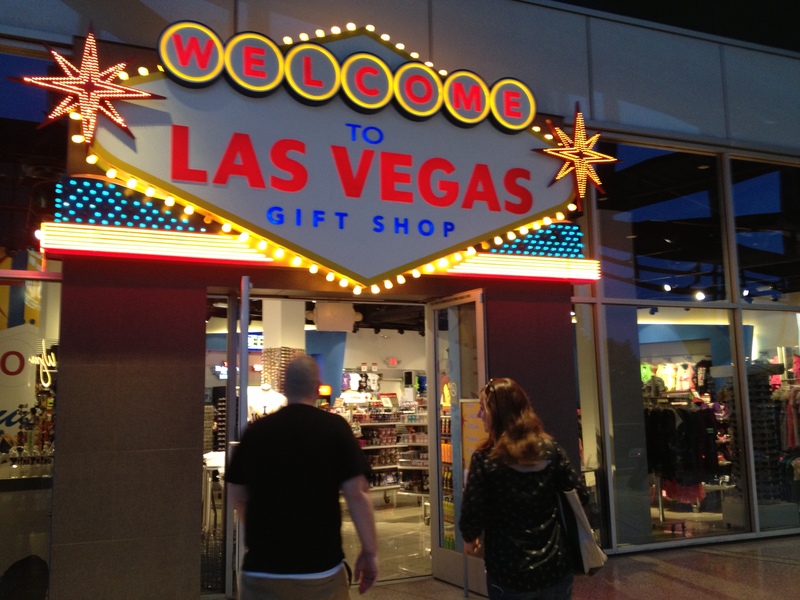 4 Responses to Seven swanky lobbies to see : Vegas hotels (Part One)! A part of the world I have never lived or visited in. I feel like an alien in my little cubicle of the world. I loved the photos. I loved the tree!!!! The tree was gorgeous and I had many more pics to post. But I’m trying to write more frequent shorter pieces. Take my word. These lobbies are breathtaking!